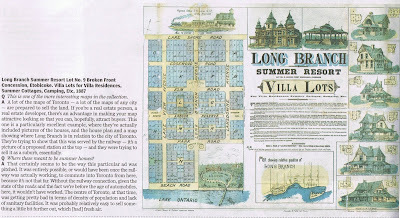 Long Branch was once a sleepy village and summer destination centered on Lakeshore Blvd., between the villages of New Toronto and Port Credit, along the shore of Lake Ontario. Long Branch stretched from the Lakeshore Psychiatric facility lands in the east, to Etobicoke Creek, which is the now the border with Mississauga, in the west. Long Branch was named after the tremendous, once-plentiful old oak trees whose branches shaded the region and its cottages. A few of these old cottages still remain in the area. Long Branch had the Grand Trunk rail line running north of, and parallel to, Lake Shore Rd. [now "Blvd. "], which is still today a heavily-used main line into Toronto. Long Branch also had streetcar service along Lake Shore Rd., from Toronto all the way to Etobicoke Creek, starting July, 1895, on track built by the Toronto and Mimico Electric Railway. (Click on photos to enlarge!) 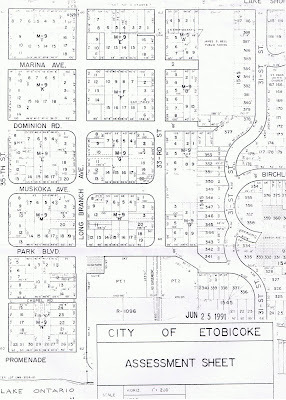 (above) A map of Long Branch, from the former City of Etobicoke, showing the same area as the older map. This map, dated June 9, 1967, was signed by A.G. Taylor, Chief Technical Engineer. Lovely Long Branch Ave. as seen on the old map is still known by the same name today, but "Lansdowne Avenue" is now the creatively-named 33rd St., and the idyllic "Lake View Avenue" is now an equally non-descript 35th. St. I guess Long Branch Avenue is the '34th St.' that, thankfully, never was! "Lake Shore Road" is now Lake Shore Blvd. W.
"Edgewood Rd." is now Marina Ave., "Elm Road" is now Dominion Rd., the "Arbour Reserve" is now Muskoka Ave., "Park Road" today is Park Blvd., and "Beach Rd." is now called Lake Promenade. The old map shows interesting details like the "Church Reserve" square at the west end of the old Arbour Reserve, and the "Gymnasium Hall" at the east end. Was there ever was a church or a gym hall at these locations? On the Gymnasium Hall square of land, at the east end of today's Muskoka Ave., there is now a group of low-rise 1950's era apt. buildings. At the "Church Reserve" square of land on the west end, Muskoka Ave. today crosses 35th St (old Lake View Avenue) into the Church Reserve, and becomes a dead end. Today there are homes in that square. It looks like there was an extra lot added at the south-west corner of old Lake View Ave. and the Church Reserve (ie, directly north of Lot 1, Block R on old map) ; and also, an extra lot was added on the north-west corner of Lake View and Church Reserve. (ie, directly south of Lot 5, Block Q on old map). Also, lots 8 and 9 of Block Q, and lots 7 and 6 of Block R, were given additional depth. Even today these lots sport extra deep front lawns. Also of interest are the two squares called the "Electric Place" shown at the north-east and north-west corners of Long Branch Ave. and old Elm Rd. (today's Dominion Rd.) I wonder what Electric Place was meant to be. Today, there is a small, 1960's era, six-plex-style building on each of these two corner squares. Then, on the south-west and south-east corner of Long Branch Ave. and the old Park Rd. on the old map, there are two squares called "Fountain Square". The lot on the south-west corner now has a small 1950's or earlier era low-rise apt. building. The square on the south-east corner of Long Branch Ave. and today's Park Blvd. (measuring, like the other squares, approx. 100 by a 100 feet), can be still seen today as a nice tree-filled parkette. There is no fountain today (if there ever was one) but right in the centre of this land now stands a fine, large stone memorial Cenotaph. The area south-east of the Cenotaph is shown in the old map as perhaps a kind of park, with a pier into Lake Ontario, a tree-lined circle road called Long Branch Drive, and also shows two grand buildings. (I wonder if they were ever built.) This was a heavily-treed area even into the 1950's, and there had once been a popular dance-hall-hotel located there. There is no trace today of Long Branch Drive; that entire area contains five mid-rise apt. buildings, and the 'new' Lake Promenade now winds its way east along the waters edge. Also interesting are the squares of land laid out within the blocks of lots, as seen with blocks L,M,N,G and H on the old map. They were served with access from the main road by two small laneways leading into the interior blocks from different roads. This was where you could drive your carriage into the rear of your property, and have a little place for the horses to stretch their legs out back too! The interior squares of blocks L, G, M, and H, and their access laneways have all but disappeared, as they were sold over the years to adjoining property owners, which extended the depth of their backyards. Even on the new map, you can still see the dotted lines which show where the interior squares and their access laneways had once been. It was within these interior squares that some of the oldest remaining trees could be found. However, the access laneway of Block N, as seen on both maps, does still exist today; the old lane has now become a narrow street called Chapel Rd. But in this case, the interior square of Block N has also been sold off; the difference being that the front yards of these lots were extended towards the lane, allowing new houses to be built, using Chapel Rd. as a city road frontage. Wonderful retrospective. I liked the old map! Dion shifts around his "Green Shift"
What will Dr. Kitts do to St. Kitts? Jim Bradley: Cassandra or Colonel Sanders? Is the Skyway safe from below?